An icon of Australian touring car racing, Allan Moffat OBE was a resolute driver and a savvy professional who captivated audiences during one of Australian motorsport’s most competitive eras. Set to be inducted as an Athlete Member into the Sport Australia Hall of Fame at the 34th Induction and Awards Gala Dinner on Thursday 11th October 2018, Moffat becomes only the fourth motor racing identity to receive the prestigious accolade alongside Formula 1 greats Alan Jones MBE (1985) and Sir Jack Brabham AO OBE (1985), and his great touring car rival, Peter Brock AM (1997). In what was the heyday of touring car racing, Moffat was an intense competitor and from 1965 to 1989 won 32 of his 100 starts, claiming the Australian touring car championship four times. But it was at two of the biggest events on the calendar where Moffat saved his best racing, Bathurst and Sandown, winning four and six times respectively. Many of those victories were at the expense of his famous rival and good friend, Peter Brock, an adversary Moffat remembers fondly. “Peter and I were very friendly,” the 78-year-old recalls. Moffat’s championship wins were in 1973, 1976, 1977 and 1983, his Bathurst victories in 1970 and 1971, then 1973 with Ian Geoghegan and 1977 with Jacky Ickx, while his Sandown triumphs came in 1964, 1969, 1970, 1974, 1983 and 1988. But Moffat’s influence on Australian motorsport went well beyond the winner’s podium, bringing a new level of business professionalism to motor racing, pioneering the use of sponsorship in a way that would change the sport forever. Born in Canada, Moffat moved to Australia at age 17 with his family and started motor racing in the early 1960s. After gaining valuable experience in America, he returned to Australia full-time in 1969 and became a regular in the touring car championship, driving a Ford Mustang, the first in Australia to have major corporate sponsorship. Moffat regards the Mustang as “the definitive race car of my life” – a car in which he won 101 championship and non-championship races from 151 starts between 1969 and 1972. With a close association with Ford for the bulk of his career, Moffat was a key plank in the car company’s marketing campaign, something he believes he didn’t get the acknowledgement he was warranted at the time. Years later at Bathurst in 1977, Moffat and teammate Colin Bond produced the best result for Ford in the history of the race, finishing one-two, an achievement made even more incredible when it was revealed Moffat drove the final 12 laps without brakes. “It was special,” Moffat recalls of that victory. Bond had caught up to Moffat in the XC Falcon but backed off as the pair flew down Conrod Straight to let his boss and Jacky Ickx take the chequered flag. “Colin was behind me, and we just did what we had to do to cross the line. I wasn’t scared." Colourfully described as having ‘ice flow through his veins’, Moffat was renowned for his attentive focus on race day. Half an hour before the green light, Moffat would be in the car and unresponsive to the world around him – in his mind, the race had already started. “I sure as hell wasn’t looking around to where the girls were,” quipped Moffat. A self-described perfectionist, Moffat took this professional approach as he became one of the most respected team owners and managers in the industry. Moffat twice held the record for most touring car championship round wins, firstly 25 and then with 32, both benchmarks eventually being overtaken by Peter Brock during their epic rivalry. He retired from racing in 1989, bowing out with a win in his last race, the Fuji 500 in Japan, partnered by German driver Klaus Niedzwiedz. 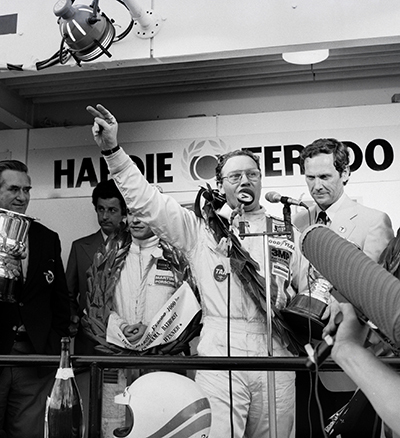 “Already an inductee to the Australian Motor Sport Hall of Fame in 2016, Allan has done so much for our sport and this latest honour is testament to the standing in which he is held. Allan Moffat OBE will be inducted into the Sport Australia Hall of Fame on Australian sport’s night of nights – the 34th Sport Australia Hall of Fame Induction and Awards Gala Dinner on Thursday 11th October at Palladium at Crown, Melbourne.